Way up north in the hither lands, in the remote forest primeval which abounds there, my bride and I made camp on the shores of this wild lake. A plot so far off the beaten-path, nary a soul was to be seen, nor man-made sound to be heard. The caustic drone of traffic on tarmac, and sirens and car alarms too, at last replaced by the ever-soft whispers of the breeze gently slipping through the Norway Pines. The lake, so cold and so clear, lapping at the pine-studded shore, whilst the heady serenade of loon song tugged on ethereal strings, that which seem lashed about the tender grommets of your soul. Yup, that’s the north country for you. Minnesota’s esteemed canoe country. And we try to go up there as often as we can, naturally, if only but to hear the loons sing strong once again, and smell that glorious, pine-tinted air. And maybe, if the culinary fates will have it, to procure something tasty over the open flame. Let’s head back to camp, shall we, and I’ll show you what’s for supper, and how it went and came to be, patron to paradise. We brought a little something along with us from the home pit, as you can see. The latest material brain-thrust from our friend, Cam, at http://www.mojoegriddle.com . We’ll admit it, we have pretty much fallen deeply, and irretrievably in-love with this 1/4 inch steel behemoth of a griddle, and like a puppy, we found it quite difficult to just leave it at home. 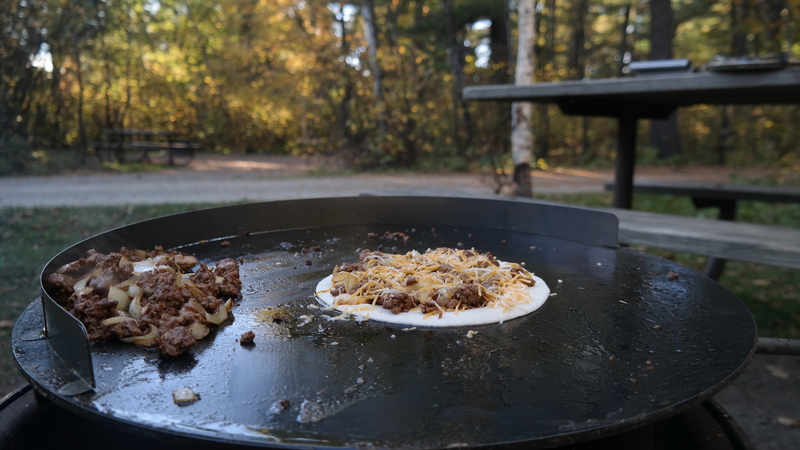 I was craving a little sublime camp fire cooking, you see, and quite frankly, this griddle is too much fun in a campsite not to show you. In point of fact, and in retrospect now, I think this was the most pleasant cook over a camp fire I’ve maybe done…ever. Everything just fell perfectly into place. There is a definitive poetry where flame meets high-grade steel, and we’re here today to tell you about it. Thus, and over a crackling pine fire, the Mojoe Griddle came up to temp whilst I dutifully chopped a yellow onion in kind. The trick to chopping onions, my wife says, is not to get emotionally attached to them. I guess this prevents shedding tears or dramatic what-nots associated with onion cutting. I dunno, you take that advice as you will, whilst I plop a great matter of them over this freshly oiled griddle-top, and get about the business of making supper, here in the soft, dappled light of our northern encampment. I also chunked on a pound of 80-20 ground beef, where it sizzled alongside the sauteing onions in a perfect gastronomic union fit for a king or lumberjack alike. Mercy it smelled good in camp tonight! And a lone Bald Eagle soars just past a canopy top of ruby-red maple leaves, freshly turned against a gorgeous, blue, Minnesota sky. From up in the birch trees, where the cool breeze gently fluttered the autumn leaves, a lone whiskey jack spied down upon us. 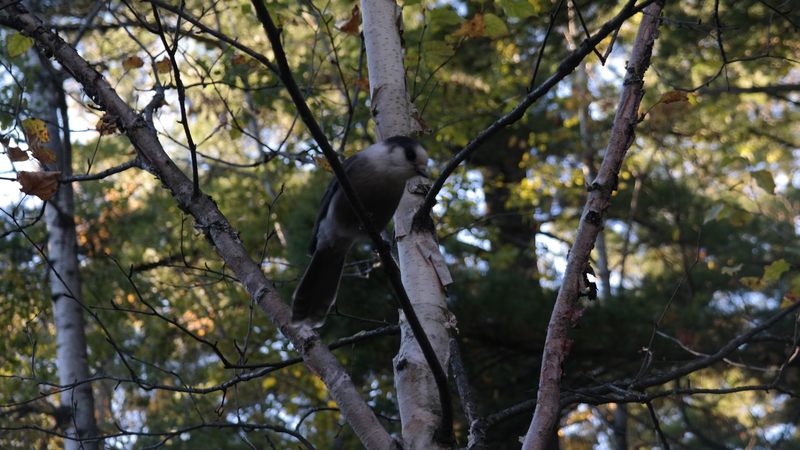 The “camp robber” of canoe country, it was his territory we were in, and what aromas lofted his way, let’s just say he had a sense of bird entitlement or something, and perched there always, begging like the aforementioned puppy you can never leave behind. We tossed him a scrap or two of tortilla shell, in between our other duties of stoking the fire, stirring the spoils, and listening to the loons warm up across the lake. I stood abreast the fire pit, hot tin cup of cocoa in hand, my red flannel shirt buttoned up, and mused for a moment how wonderful it was to tarry lake-side like this, and cook a simple supper over a flickering wood fire. I need to do more of this sort of thing, I thought. And I supposed also, that old Whiskey Jack in the tree yonder, he must see guys like me every weekend there, standing by the fire, all thinking the same thing. When the hamburger and onions were complete, we dashed them over rather liberally with some taco seasoning, stirring it in thoroughly, whilst splashing some water in it to simmer it back down. 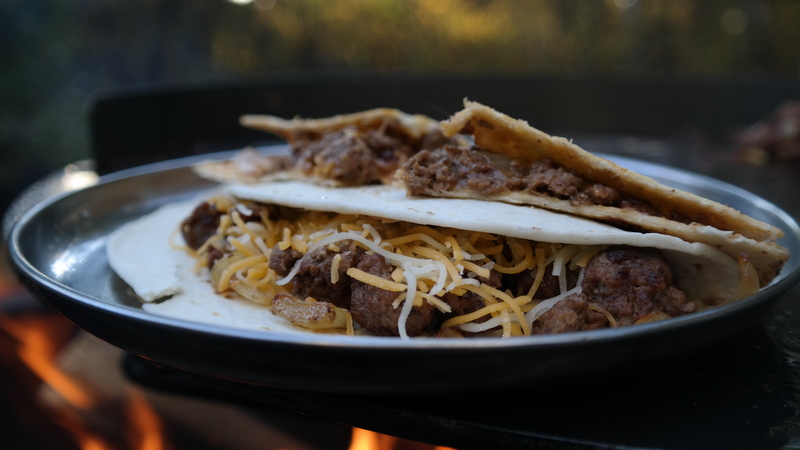 When a sample tasted right, we banked the meaty goods, onions and all, over to the cooler side of the griddle, and placed a lightly oiled tortilla over the hot area. Loaded it up appropriately, including a pile of shredded cheese, and let it henceforth sizzle there like a Barry White song. 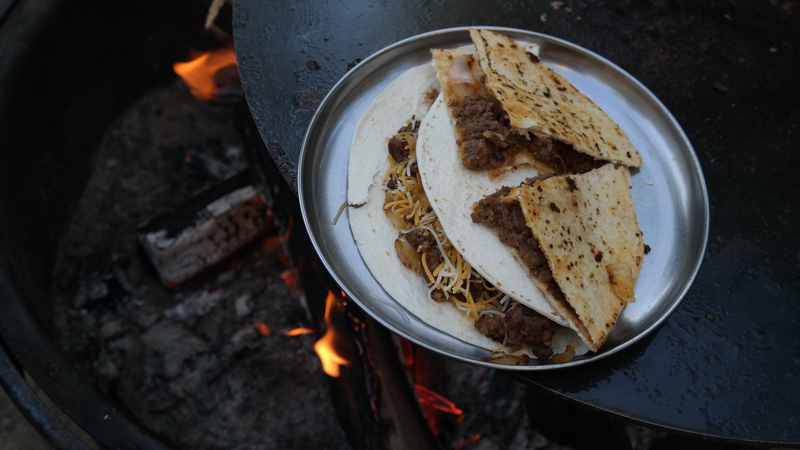 Lay another oiled tortilla on top to complete this backwoods quesadilla of sorts. The crux move here, of course, is to flip the entirety of the quesadilla in a fashion resembling a bloke who knows what he’s doing. With that said, we may or may not have lost a few more scraps to the camp robber, but at the end of the day, our plunder speaks for itself! So we made up one quesadilla for the two of us, and a few soft shell tacos to boot. That’s the privilege and simultaneous challenge of camp cooking. Your choices are indeed scant, and far removed from the convenience of a grocery store just down the road. In camp cooking, you get what you’ve got! But rest assured, the food is always wonderful, patron to the beautiful location, and the effort it took to get there. Even a humble, old, bologna sandwich is a triumph in food technology if consumed in the prettier places. Location is the spice! Camping folk will know from what I mean. Others will only presume. Once again, we were enamored with the authority in which the Mojoe Griddle handled this field test. 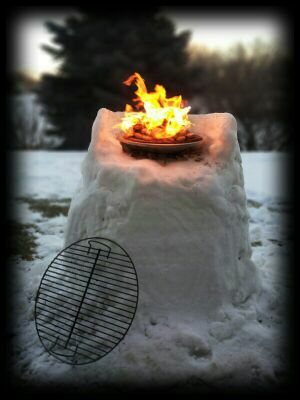 It was at home over the fire pit, like it was born to be there all along. We didn’t even need to use the three steel legs that came with it, tho that could have been an option too. You’ll have to examine the fire pit you’re working with, and use a bit of your brain to figure out the best move. This griddle is a versatile cooking surface. In our case this weekend last, we got away with placing the griddle right atop the fire grate provided by the forest service. Leveled with three small stones, it worked pretty slick too. We are able to swing the grate/griddle laterally, and clear of the pit, when ever we needed to tend the fire, and then just swing the griddle back over the fire when done. Wonderful! And we cannot discourse highly enough how luxurious it is to have such enormous cooking real estate when cooking over the fire. No standing in line for the frying pan when there is a Mojoe in camp. No sir. 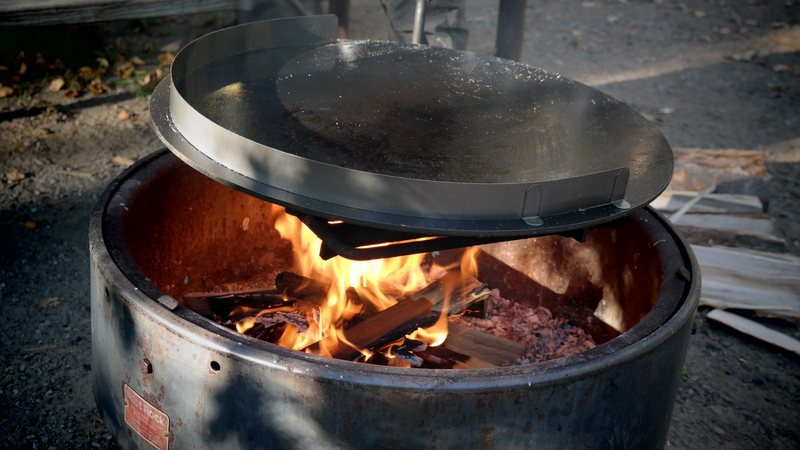 Having done a great deal of cooking for large groups in campsites past, boy how I wish I had one of these griddles then. But alas. Another thing we noticed with the griddle, and this may just be in our heads, but there seemed to be a notable lack of smoke and heat hitting your face when stooped over tending your vittles. This compared to doing the same thing with, say, a cast iron frying pan or something. Well, my working theory for this is the griddle is so large, that the very thing you are cooking with, also acts as a shield, blocking the intense heat from the camp fire, thus making your life a more pleasant place to be. 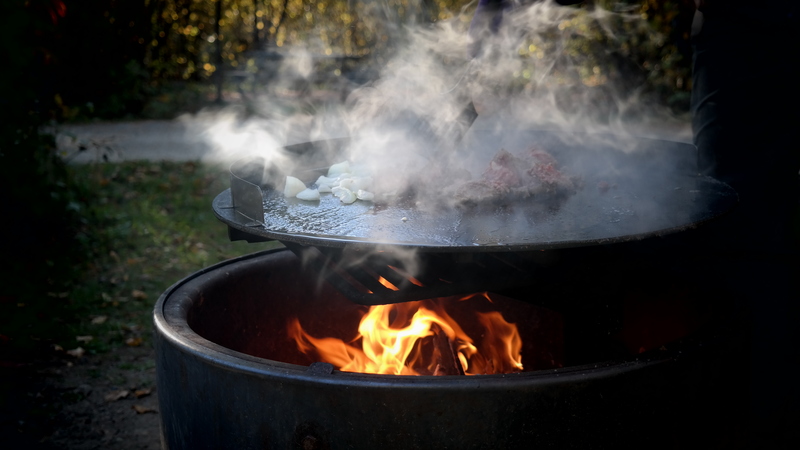 The universal bane of camp fire cooking, smoke, also seemed reduced some what, or blocked by the enormous Mojoe disc. Like I said, it could be all in my head, but that’s what it seemed like. 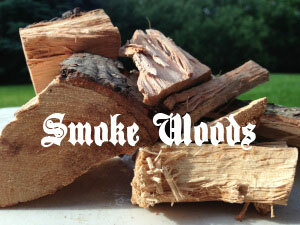 A little backwoods Mexican, people, pleasurably prepared and cordially consumed, fireside, with the Mojoe Griddle. I burped and wiped my chin, and sauntered down to the lake again, content with what I had done, and where I was and aimed be. I sat on the shoreline and once more gazed out over the shimmering water. The lake still lapped at my feet, and the breeze flirted through the piney woods. My tummy was tight, and for a moment, nay, much longer than that, all the world seemed gracious to me, and deliciously right. And another eagle rose on the thermals. Amen. This entry was posted on October 6, 2015 by Patrons of the Pit. 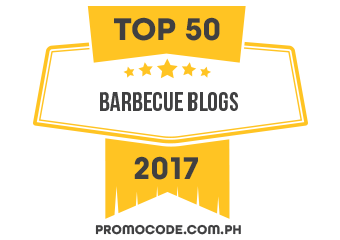 It was filed under Uncategorized and was tagged with bbq, camping, cooking, food, foodie, hunting, mojoe griddle, nature, outdoors. The secret to chopping onions is to not get attached. I so love that line. You’re bride sounds like a true wit. The food sounds delicious. I’m growing more intrigued with the griddle. I want one. Roger that, Todd, she is. We will pass each other in the hall way, she’ll stop me and croak, “Am I funny?”…And all I can do is laugh. The griddle is getting more fun the longer we get to know each other. Having a blast with it. It is only a matter of time before one ends up in your garage. You can fight irbid you want, but good things always find a way. Thanks Todd. You’ve turned into a right fine comment maker! I think there may be a serious relationship on the go with this new griddle. Damn that food looks good, Cutting onions has never been my forte, tears run down face. Haha, yeah I’m a bit smitten for the griddle, I admit it. I dunno, something about heavy metal and succulent food merging together in one experience that makes a man happy. Even if he cries whilst chopping onions. Many thanks, Laurie. Hope all is well enough in your world. That is what I’m talking about! !